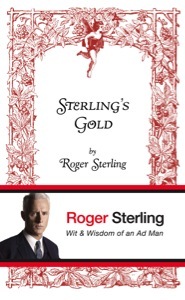 Grove Press, an imprint of Grove/Atlantic Inc., recently announced that it will release Sterling’s Gold: Wit & Wisdom of an Ad Man by Roger Sterling on November 16. He’s the character played by John Slattery on AMC’s popular 1960’s drama Mad Men. It’s slightly confusing for those that don’t watch the show, but apparently Sterling’s memoir was a subplot on the fourth season of Mad Men and creator Matt Weiner decided to release the book for real. The book’s actual author hasn’t been revealed. This isn’t the first time a popular TV character has landed a book deal. As we previously reported, Glee’s Sue Sylvester is also getting a fake autobiography. After the announcement, Sterling’s Gold quickly became one of Amazon’s bestsellers (it’s currently #59 on their sales rankings). You want to be on some people’s minds. Some people’s you don’t. Being with a client is like being in a marriage. Sometimes you get into it for the wrong reasons and eventually they hit you in the face. Don’t you love the chase? Sometimes it doesn’t work out. Those are the stakes. But when it does work out — it’s like having that first cigarette. Your head gets all dizzy, your heart pounds, your knees go weak. Remember that? Old business is just old business. When a man gets to a point in his life when his name’s on the building, he can get an unnatural sense of entitlement. Remember, when God closes a door, he opens a dress. Taken as a whole, Roger Sterling’s pithy comments and observations amount to a unique window on the advertising world—a world that few among us are privileged to witness first-hand—as well as a commentary on life in New York City in the middle of the twentieth century.